It is a truth universally acknowledged that a brilliant story told once needs to be retold for a modern audience, and so it is with Jane Austen's classic Pride and Prejudice, which has been retold by Curtis Sittenfeld as part of The Borough Press' Austen Project. This is the Pride and Prejudice we all know and love, brought bang up to date. Bingley is as shy and naive as in Austen's original, but now he is a doctor - one of the ultimate status symbols in the modern world - and a reality TV star after a stint on Eligible where he searched for (and failed to find) his soulmate. His friend Fitzwilliam Darcy, a neurosurgeon, is as haughty as Darcy in the original, while lovely Jane is a yoga teacher and smart Lizzy is a journalist. The familiarity of Eligible is pleasing, but there are enough changes that the story feels refreshing and not wholly predictable. Jane's story especially gets a twist that could only be possible in the modern world, while cousin Willie has made his fortune and reputation as a tech entrepreneur (a religious figure for these times). Meanwhile Lizzy is trying to deal with the modern American phenomenon of huge medical bills and how to pay them, as well as, of course, the awful but not really awful Darcy. It's with Lizzy and Darcy that the best parts of Eligible are found, as they should be. Their relationship is full of tension, which the pair use as an excuse to engage in acts that would have made Austen blush. The tone of their interactions is pitch perfect, infused with snark, respect, lust and love over the course of the book. Where I don't think Eligible stands up is with Jasper Wick, this retelling's Wickham. We're introduced to him very early on as Lizzy's university friend, on again off again not quite boyfriend, and the man she can see herself marrying. Unfortunately, I found him to be a charmless individual, clearly using Lizzy for his own ends, and thought he was a man any intelligent woman would see in a matter of seconds was a useless wastrel. The reason Wickham works so well in Pride and Prejudice is because there is a charm about him - you know he's no good, but you kind of like him anyway. In Eligible, you just know he's no good, which led to me not being bothered by him as a character, or his relationship with anyone else in the story. Overall though, Eligible is a lovely read. It's a long book, clocking in at more than 500 pages, but it's a quick read. I found it amusing and fun, and thought it largely kept the tone of Austen's original, although there were a few times it felt like Sittenfeld was trying to cram every aspect of modern life into the book. It's not better than Pride and Prejudice (what retelling could be?) 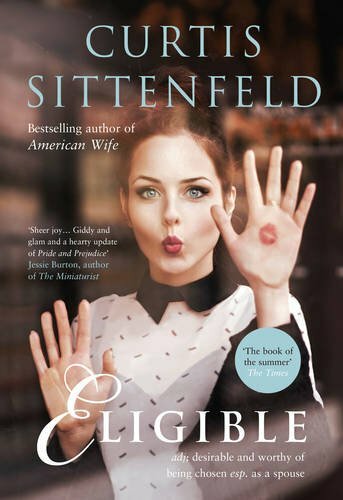 but Eligible is a worthy retelling, and Sittenfeld does well to keep the spirits of Lizzy, Darcy et al alive.